Originally from Door County Wisconsin by way of Seattle, WA, as an artist, what do you like most about living and working in Brooklyn? I love the large community of illustrators here! 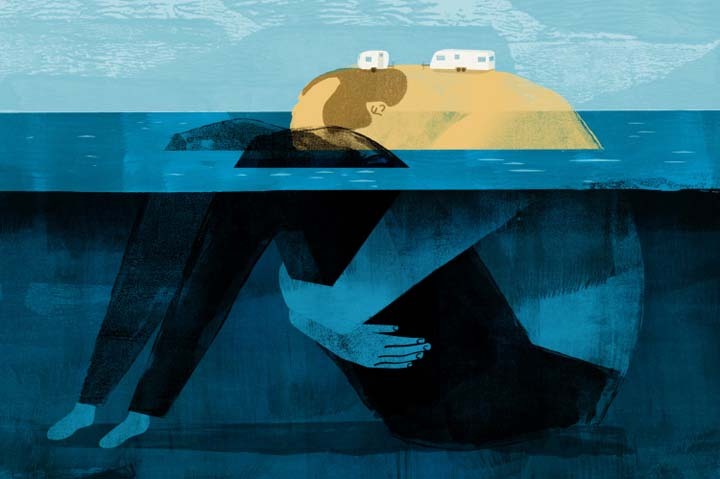 Our line of work is so solitary and having lived in smaller cities I know first hand how easy it is to go years without talking to another illustrator. It gets lonely when no one around you quite understands what you do for a living. Inspiration and motivation are so much easier to come by when you're surrounded by others who are pushing themselves to make their best work. i can remember being interested in drawing as early as kindergarten. I was one of the class artists and I've always been drawing. I got into comic books in high school and became interested in illustration as a profession once I got to art school. I liked how the major wasn't tied to any one medium or process; I was free to try out and experiment with styles and techniques. Tells us about your art/design background. Where did you study? What was your experience there like? I grew up in a teeny tiny farm town in Wisconsin. I got my BFA in Illustration at the Milwaukee Institute of Art and Design (MIAD) in 2000. It was a small school and a lot of students there didn't seem very serious, but there were a couple of exceptional teachers that got me on my path and I'm grateful for that. I majored in illustration but took a lot of printmaking and photography classes. Once I graduated I worked as a junior designer at a Milwaukee design studio for two years and then moved to Seattle and went full time freelance with my illustration. I've been at it now since 2002. By 2010 I was getting burned out on the work I was doing, mostly conceptual corporate finance assignments, and I was ready to make work that was more meaningful to me. I moved to Brooklyn in the summer of 2011 to attend Marshall Arisman’s MFA program at SVA [Illustration as Visual Essay] and my world of illustration has been expanding exponentially ever since. My first assignment was a 1/4 page for Milwaukee Magazine back in 1999. I set up a portfolio review with the Art Director there and mercifully she gave me a shot. It paid $165. I thought I was rich. My favorite part starts after a concept has been approved by the client. I have the most fun taking a sketch to a finish because it doesn't require any critical thinking, no stress. I get to listen to podcasts or blast my music and experiment with whatever medium I feel like working with that day and create something that didn't exist just a few hours prior. It's total playtime, there is nothing else I'd rather be doing. I do have sketchbooks but they're mainly used for conceptualizing editorial assignments. When I have a lot of down time I'll do some self initiated drawing but those times are rare. Many times I skip the sketch book altogether and start right in the computer, though when I'm stuck on a job it's great to flip through them to see if I can pull anything from old ideas. Medieval and Byzantine art; midcentury folk art like Morris Hirshfield and Charlie Harper; abstract expressionists like Larry Rivers; and I've recently gotten into Balthus. I would also add my marriage and being a father to my 5-year-old son has had a huge impact on the subject matter of my work. Usually NPR, This American Life, or similar podcasts, the occasional audio book... and then a lot of kraut rock. The last one I've been to that made a real impression was the de Kooning retrospective at MOMA last year. It really inspired me to do more by hand and depend less on the computer. It also made me realize that I had been following so many rules with my image making, rules that don't actually exist. Having an online presence helps to make you look credible when an Art Director searches for you, but rarely do I approach or friend art directors online. However I've had a lot of luck with my work being featured on design blogs like It's Nice That, and The Fox Is Black. More people read those than I ever thought. But I believe the best advertising is still the published work itself. Where did your idea for We Tell No One originate? What was the most difficult part about getting from idea to finished art? We Tell No One is the book I made for my MFA thesis. It's a book of illustrations inspired by found notes. The idea came to me years ago when I first heard of Found Magazine. It's a magazine that publishes notes and other things people randomly find. I always thought it would be a rich source for illustration and good anchor for a series. The notes are raw, personal and quite emotional, they're also completely and utterly sincere and unpretentious. The hardest part was getting out of my own way. I wanted to use the project as a vehicle to get very experimental and take risks. I expected to make work with a lot of raw energy. But I wasn't drawn to the results I was getting and I found myself gravitating more towards subtlety. In the end I had to let go of this idea of who I thought I wanted to be and embrace what it is I do naturally. When I get really stuck I'll run ideas by my wife, she's saved me more times than I can count. Or if I have the luxury of time I'll sleep on it. Anything I can do that will clear the cache in my brain so to speak and that usually helps. I've learned that if I'm really struggling with something it's because I'm approaching it the wrong way and the trick is to distance myself from it so when I come back I can see it from a new angle. What was the biggest mistake you ever made and what did you learn from it? Sending concepts I wasn't completely excited about to art directors. I spent a good portion of my career second-guessing everything I was doing and handing in work I thought they wanted to see instead of making the work I wanted to see. Not only was the work derivative and lousy but I was making it much harder for myself than it needed to be. I've since learned to be selfish and only send the ideas I'm excited about even if I think the art director won't like or understand them. And also just to trust that the art director wants to make relevant thought provoking work just as much as I do. Look inward for inspiration, not outward. The most interesting stories we have to tell are usually the most personal. 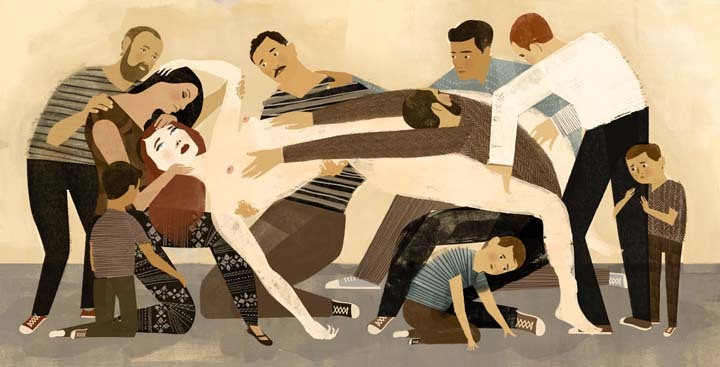 Keith Negley has a BFA from the Milwaukee Institute of Art and Design, and an MFA from the School of Visual Arts. Born in Connecticut, raised in Wisconsin, Keith spent his 20s in Seattle, and is currently living in Brooklyn, NY. His work has been published in many of the country’s largest newspapers and magazines, and featured in annuals such as Society of Illustrators, American Illustration, and Communication Arts. Clients includeThe New York TImes, Newsweek and Plansponsor.